After a restful night we began our first day in Nashville by visiting Hill Center Brentwood, a mixed use district of a commercial and retail project. The developer of the project H. G. Hill Realty is one of Tennessee’s largest development companies and the general contractor is Turner Construction. The size of the overall project is 32 Acres with 450,000 square feet dedicated to office space and 120,000 square feet for retail space. The development will consist of many unique restaurants, parking garages, retail stores, banks, open parks spaces, and much more. Up to date, the following tenants have committed to establishing branches at this location: LBMC, First Tennessee Bank, The Cosmetic Market, Hand and Stone luxury spa, Cori and Co. Baby Child, Uncle Julio’s Mexican Restaurant, and Nama Sushi Bar. The purpose of this development is to encourage a more walkable and healthy environment that reduces overall automobile usage and sprawl development. Upon entering the Turner Construction site office, we were greeted by Chris Henning, project manager for the development, and James Tapp, the safety director on site. Both individuals have been involved with the project since it began 14 months ago. However, Turner Construction has been successfully established in Nashville over the past 40 years. 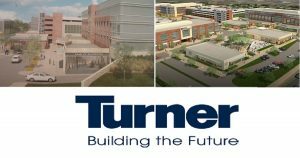 Currently, Turner is responsible for building 16 of the 32 acres for the development and have a contract worth $63 million. This amounts up to six buildings consisting of one parking garage, two parking spaces, and two mixed use office spaces. Chris and James described some of the challenges as well as innovative management techniques involved with this project. Currently, one of the main concerns is the start of construction for the other 16 acres of the development. Which will involve more precise coordination with new general contractors and laborers on site. Turner construction has also been urging to move towards self performing their work. This project is a stepping stone in exploring that by self performing almost all of the concrete related items. Thus far, it has been a positive learning curve for the Turner team on site and they are looking forward to setting it as a guideline for other projects throughout the United States. Another concept encouraged in this project is lean construction and promoting efficient work stations for subcontractors. Lean construction is a fresh and innovative technique that allows for increased productivity, efficiency, and safety on a project. It emphasizes schedule and work flow reliability starting from pre-construction to all other phases of the project. For example, James explained that laborers are required to move all heavy materials using mechanical equipment instead manually moving material from one place to another. Another rule is no materials or tools should be touching the ground. This allows for increased safety and productivity for everyone working on the project. James stated that “75 to 85% of safety issues can arise from uncleanliness on a job site. A clean job site is a happy job site.” Lean construction’s end goal is to eliminate resource and time waste by reducing the amount of re-work and waiting. It was very inspiring to see processes and systems, which we have learned in our classes, being implemented to real life applications. It was reassuring to see the push to adapt a new generation of construction. 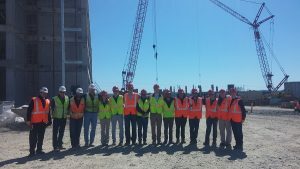 We would like to thank Turner Construction for setting up such a interesting and informative site visit.